The last thing we want for our wholesale customers is to be stuck with baskets that won’t sell because they are squashed or out of shape. So here is a quick guide to displaying your market baskets, in a way that both looks good and keeps their structural integrity intact. This is the worst thing you can do for your basket's shape. While it may seem easiest to just pile all your baskets inside each other, right side up, it is the quickest way to ruin your product. The baskets themselves seem quite light, but once they are piled on top of each other they carry a fair amount of weight. You’ll notice that the baskets on the bottom of the pile will start to widen, with the bottom bulging outwards, giving it a squashed appearance. Nobody wants to buy a squashed basket, so try these methods instead. A nice space saving technique is to hang each of the baskets off a rack with multiple arms. This is great if you have purchased several different styles, as it showcases the variety of colours and sizes available. It also makes it easier for the customer to browse, as they do not need to search through a pile of baskets one at a time. If you are stuck for floor space and need to keep the baskets in a pile, flip them over and store over a small pile of upside down plastic buckets. The buckets will help the baskets maintain their shape whilst also keeping them off the floor, away from dust. The buckets can’t be seen under the baskets, so you can just purchase some cheap plastic ones. If you have a shelf big enough for your market baskets, use it! While it may take up a bit more space, it is the best way to show off the details on each basket. If you must pile two together, you can, but we recommend each basket stands on its own. 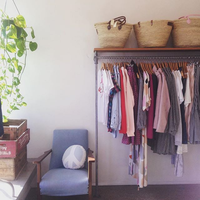 We liked this display from Betty Mim (above) where unused space above a clothing rack was transformed into a shelf full of market baskets. Statement wall hooks are very on trend at the moment, and serve as a functional way to display your market baskets. 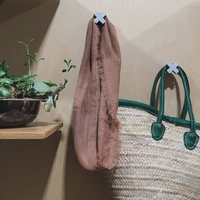 Big, bold hooks act as a form of wall art but also perform the practical purpose of giving you somewhere to hang your baskets, along with other products like towels, throws and scarves. If you are unable to put the hooks directly into your shop walls, try adding them along the front of a table or the back of a door instead. Down the side of a bookcase is another great place too! 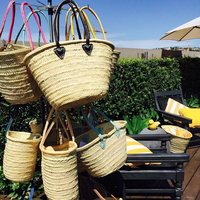 We’d love to know how you display your baskets. Comment below with any suggestions you have – we’d love to hear from you!